After seeing nolaboard’s Antarctis Stole I coveted one for myself. Season of Lace and Ravelry have that effect on me. I thought of winter in the Antarctic and wanted something dark and rich. Using some stash wool/silk in a nearly navy blue I cast on the Antarctis Stole this past Monday on my way into Tulsa for a dentist visit. The dental appt was painful and my face was numb for nearly five hours but thankfully my fingers weren’t. They flew through the first twenty rows, about 20,000 stitches and I had a great start on the dark mountains that border this lovely stole. I’m now on row 40 and about to begin the dark night sky! What a smooth and rhythmic pattern to work on! I’ve pulled out some beads, a silver lined blue to sprinkle in the night sky – and maybe I’ll throw some silver lined clear in too for sparkling stars. 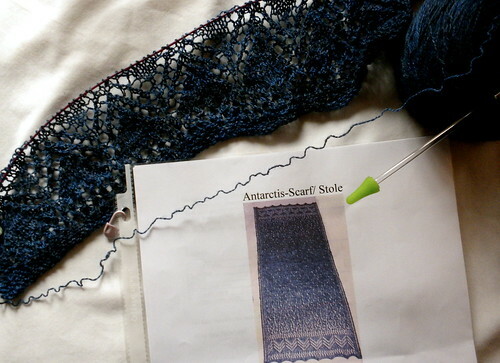 On another note: One of my knitting friends has requested a skein of the Wild Violet – Lost City Silk that I used in my Echo Flower (see post below) so I’ll be in the studio either late this week or early next whipping up a skein or two – trying to recreate the color from the notes my dyeing journal. 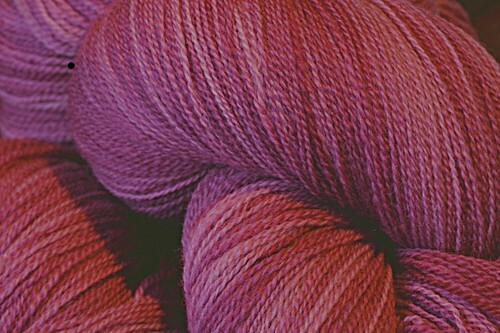 If anyone else in interested in buying a skein, send me an email so I’ll add enough silk to the dyepot. Chris and I had a discussion recently about my dyeing process. He asked what’s up with my “themes” each month. I had a hard time putting it into words but what I told him is that I’ve discovered that I see in my mind the colors for several weeks before entering the studio to dye. 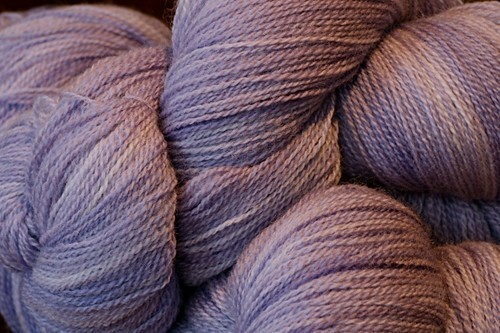 I knew February’s yarn offering was going to be in the purple ranges – a soft blue/purple and a rose/purple. I started looking for the colors in my mind out in the world surrounding me. This farm is one of the most inspirational places I’ve ever encountered and what I discovered was the colors in my mind were shades from the sky. Before the sun breaks the eastern horizon there is a pale blue-purple outside our window – and it only lasts for a few moments. And on certain nights a purply-pink blush streaks the western sky – it barely lingers before giving way to something darker. So you see, the colors that I saw were both fleeting moments that I then had to try and recreate with dyes and yarn. It took several tries with the mixes to get the colors to what I thought was right. It’s hard to see actually what the final color will be since the yarn is darker when wet – and a dyer has to learn to trust what she/he sees in their mind and what they mix with their hands. Each is 1000 yards and weighs 90grams. After seeing nolaboard’s Antarctis Stole I coveted one for myself. SoL and Ravelry have that effect on me. Using some stash wool/silk in a very nice dark blue I cast on Antarctis this past Monday on my way into Tulsa for a dentist visit. The dental appt was painful and my face was numb for nearly five hours but thankfully my fingers weren’t. They flew through the first twenty rows, about 20,000 stitches and I had a great start on the dark mountains that border this lovely stole. I’m now on row 40 and about to begin the night sky! What a smooth and rhythmic pattern to work on! I’ve pulled out some beads, a silver lined blue to sprinkle in the night sky – and maybe I’ll throw some silver lined clear in too for sparkling stars. PreviousPrevious post:Wild Violet Echo FlowerNextNext post:Releasing the Meatballs – Again.